Well, it happened! Exciting, wasn’t it? 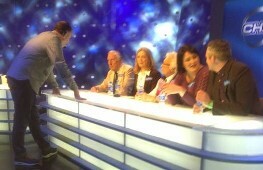 Sadly the People’s Book Prize team didn’t scoop the Eggheads Prize (can’t win ‘em all, eh) but we got jolly close. The main thing was that we had a terrific time taking on that amazing bunch of brainboxes, the Eggheads, and we had fun as a team. Perhaps I am most proud that I managed to keep secret the final result for a WHOLE YEAR. A career in MI5 definitely beckons. Almost a year after People’s Book Prize winners got together as the Rewarding Talent team to take on the famous Eggheads, the episode will be broadcast on MONDAY, 2 FEBRUARY on BBC 2 at the usual time of 6 pm. Watch if you can – it was an exciting day! I should have read Robert Louis Stevenson’s wonderful, classic story of pirates, buried treasure and derring-do years ago. Why didn’t I? A common problem: I tried it too young and was so terrified by Blind Pew and the Black Spot that I never got further than the first couple of chapters. So, parents, resist the temptation of giving it to 9 year-olds. Even if they’re tougher than I was, they might struggle a little with the old-fashioned prose. By the time they’re 11 they’ll get into the story straight away, from the moment a mysterious dark stranger turns up at the Admiral Benbow Inn, frightening away all the customers with his pirate tales, and entrusting to young Jim Hawkins a chest containing a map of a distant island…. How Jim sets sail to find the treasure, in the company of trusted adults including the silver-tongued, fatherly Long John Silver, and the shifting alliances that lead to subterfuge, clever ruses and full-blown battles – all this makes a cracking read, more fun and more exciting than I’d ever guessed from my faltering encounter with the book all those years ago. If you, too, missed out, grab a copy now, it doesn’t matter how old you are. Just don’t be too young. Here’s a novel idea, perhaps even a bit of blue sky thinking. (Sorry, Richard O Smith’s delight in puns is catching – if only I could do it half as well as he does.) This isn’t just the biography of an undeservedly forgotten figure. The author interweaves a well-researched and detailed account of how this self-educated pastry cook, James Sadler, became the first Englishman to fly (in a balloon – we’re talking the 1780s here) with his own tale of suffering a fear of heights all his life. A marvellous opportunity for irony and comic juxtaposition, which Smith makes full use of, and the light, self-deprecating way in which he depicts his everyday battles with lifts, stairs and other terrors had me crying with laughter. But it’s more than wisecracks just to entertain; taking James Sadler as his model, Smith determines to use the opportunity to overcome his phobias, getting psychological help from all kinds of people. (I loved his description of counselling sessions, a wonderful blend of humour, scepticism, silliness and ultimately, amazed appreciation.) While Sadler’s 50 balloon trips, nearly always in appalling weather, are testament to the man’s courage, Smith sets himself a target which for an acrophobic (ha, I learnt a new word) requires a pretty large amount of guts: going up in a balloon himself. Does he make it? Well, you’ll just have to read the book and see. Yes I know this is cheating – but I couldn’t choose between these two wonderful novels so have gone for both. Katherine Rundell has blazed on to the children’s books scene with her charming, fresh, utterly individual view of the world and vivid writing style. Her heroines (Wilhelmina in The Girl Savage, Sophie in Rooftoppers), are brave, passionate, gifted and loyal, with a total lack of interest in minor details like washing, clean clothes and good behaviour. Both girls need all their courage, strength and agility to overcome the heartlessness of the adult world. Losing her idyllic life in Africa, Wilhelmina escapes from the harsh boarding school to which she’s been condemned; while Sophie learns to negotiate Paris by rooftop to stay one step ahead of the Authorities who want to tear her from her beloved adopted father. Not all of the details are believable but the writing is so powerful it doesn’t matter. Robin Stevens has hit on a brilliant idea: a traditional detective series for children complete with 1930s setting, a classic English country house (well all right, a boarding school) and the perfect cast of suspects: half a dozen or so school mistresses and a master (amusingly dubbed The One), each nursing a grudge against the hapless murder victim, Miss Bell. But help is at hand. As the Wells and Wong Detective Society (aka Daisy Wells, 13, President, and Hazel Wong, 13, Secretary) sets about solving clues, an atmosphere of mystery builds up, leavened by frequent references to shrimps, bunbreak, Div, mufti and squashed flies. Irresistible. In the 1980s Nina Stibbe took a job as nanny to a London family. Her employer, Mary-Kay Wilmers, was editor of the London Review of Books and the roll call of neighbours and friends who drop in encompasses some of the top stars of the literary/theatre scene, none of whom – and this is delightful – Nina has heard of. Thirty years later Nina put together all the letters she wrote to her sister at the time and the result is this wonderfully quirky, artless account of day to day life in which someone called Alan Bennett turns up regularly for meals and proves a dab hand at mending the fridge; while Jonathan Miller is the obvious person to borrow a saw from when the Christmas tree needs cutting down to size. (Which Nina never returned – how has he been managing without it all these years?). A super read which had me chuckling all the way through, especially as Nina’s own weirdness emerges under the tolerant eye of her employer who clearly liked her enough to cope with eccentricities such as her refusal to wear shoes. Ever. Popping out to the corner shop for a carton of milk must have been quite something.